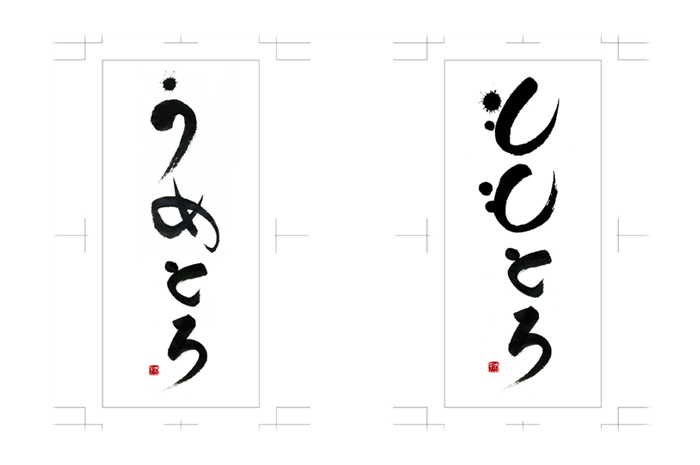 The challenge for Okunomatsu Brewery’s sake labels was to produce calligraphy that could live up to the historic weight and significance of the brand’s name, while also reflecting the particular qualities of each product. 3 new fruity flavored liquors used a calligraphic style that reflects the mellow playfulness of the liquor’s flavor. The arrangement not only considered the character styles, but also focused on providing compositions which would work well on the curving surface of the various sake bottles. Okunomatsu Brewery’s sake which carries the household name is the highest quality of all their lines of sake. The characters were made to live up to the historic nature of the name, while providing a fresh and modern edge that could work alongside their more playful products.